FX CEO John Landgraf‘s declaration in August that we live in an era of “too much TV” was the intellectual highlight of the Television Critics Association summer press tour–an event that’s not exactly known for its intellectual highlights. Landgraf revealed that, by his count, broadcast, cable and streaming brands would present more than 400 original television series in 2015, nearly double the industry’s output five years ago. This level of production, he asserted, was unsustainable. The content bubble exists, and it will eventually deflate. Some networks will go away. Only the strong will survive. The Muppets were also at TCA. Not all of them. Just Kermit the Frog and Miss Piggy. But their appearance at the press tour had as much to say about the current state of television as Landgraf’s did, and spoke to some of the same issues. Kermit, Piggy, their producers, and the unnamed puppeteers hiding beneath them showed up to promote “The Muppets,” the latest television vehicle for the creations of the late Jim Henson, now, as Kermit put it, “wholly owned subsidiaries of some big company.” That company is The Walt Disney Co., of which ABC, the Muppets’ TV home, is also a wholly owned subsidiary. Synergy, baby. 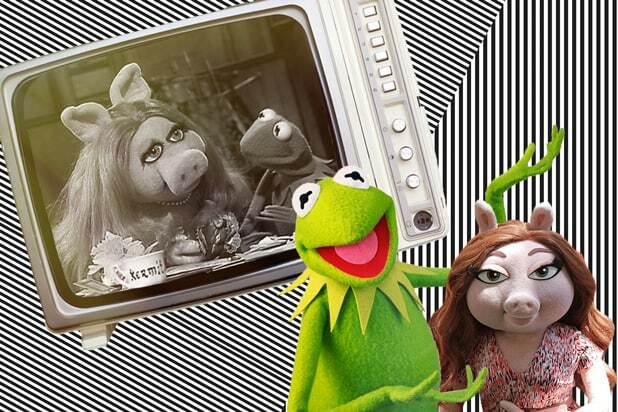 The “Muppets” session was a nightmare of journalism and a bonanza for public relations. Reporters–grown people with jobs and degrees–took turns asking puppets questions about their fake lives, maybe for nostalgia’s sake, but also maybe because we are all stupid now. The idea that the series’ creators should face questions about, you know, their television show didn’t get much play. This is part of why putting the Muppets back on TV may be brilliant. Kermit and Piggy are a brand, one with so much equity that they can delight a room full of people to the point that those people forget how to do their jobs. And they don’t just play to the olds. The franchise was successfully rebooted on the big screen, with 2011’s “The Muppets” and 2014’s “Muppets Most Wanted” establishing a new generation of fans. In Landgraf’s world of too much TV, promoting a show like “The Muppets” is infinitely easier than promoting “The Goldbergs” or “Fresh Off the Boat.” A significant portion of the TV-watching audience will sample the show because they know the characters and remember them fondly or because their children demand that they do so. Disney and ABC have made similar plays with the Marvel series “Agents of S.H.I.E.L.D.” and “Agent Carter.” But they’re not alone in recognizing the value of going franchise. This fall CBS will premiere “Limitless,” based on the Bradley Cooper movie, and “Supergirl.” NBC will dig into its somewhat recent past for Heroes Reborn. Fox will do the same for The X-Files at midseason, and before that will launch a sequel series to Steven Spielberg‘s “Minority Report.” A “Prison Break” revival is also in the works. Established brands make it easier for shows to cut through the clutter of more than 400 TV shows. They also provide ideas that are easy for producers to sell. A Supergirl TV show doesn’t need much explaining. It’s Supergirl. You either want her on your air or you don’t. And if you want Supergirl, there’s only one place you can go to get her–Warner Bros. In an era when networks heavily emphasize owning content through their studio arms, a big, proven property can be the thing that gets an independent or rival studio through the door. That works for more than just puppets and superheroes. Back at FX, Season 2 of Fargo is set to premiere in October. Landgraf, with his data-driven view of a brand-centric future, has been as serious as any executive about owning the programming on his network. But Fargo is a co-production with MGM, which has revived itself as an independent television producer in part by raiding its film library to create cable television series. That’s the kind of corporate synergy the Muppets would be proud of.